Headed into the general election against Hillary Clinton, Trump's positions on Israel are still somewhat unclear. Here's what the Republican nominee has said about Israel so far. This article was originally published on May 24, 2016. During his mesmerizing scorched-earth presidential campaign, Trump, the presumptive Republican nominee, has frequently boasted of this and other honors from the Jewish community as endorsements of his pro-Israel bona fides, including receiving the Liberty Award from the conservative-leaning Jewish publication Algemeiner in early 2015, and serving as Grand Marshall of the 2004 Israel Day Parade. Yet despite professing repeatedly that he “loves Israel,” Trump hasn’t always hit the expected talking points of the staunchly pro-Israel camp, notably causing brows to rise when he said at a Town Hall event in Charleston, South Carolina in February that he planned to be “sort of a neutral guy” on peace negotiations between Israel and the Palestinians. This impartiality was coldly received by pro-Israel Jewish leaders, isolating Trump from a Republican field that almost uniformly toed the pro-Israel line. 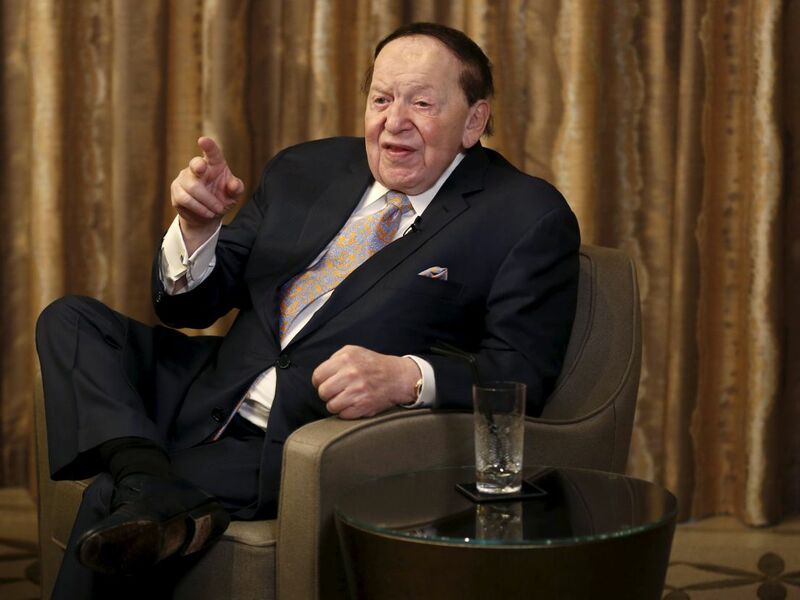 In December, several candidates met with members of the Jewish Republican Coalition to woo donors – particularly casino magnate Sheldon Adelson. At the time Adelson and his wife Miriam were torn between supporting Florida senator Marco Rubio and Texas Senator Ted Cruz, both of whom put on a passionate show at the event. Read more: Where does President-elect Donald Trump stand on Israel? Meanwhile, Trump stumbled. A day earlier, he created waves during an interview with the Associated Press in which he placed the burden of a peace deal firmly with Israel. “A lot will have to do with Israel and whether or not Israel wants to make the deal – whether or not Israel’s willing to sacrifice certain things,” he said. At the RJC event, he reiterated that point to a skeptical audience and caused a minor kerfuffle when he told the crowd, “You’re not gonna support me because I don’t want your money” and referred to everyone in the room as fellow “negotiators,” which some thought came dangerously close to brandishing a Jewish stereotype. He then dug himself deeper into a hole when he failed to pledge to maintain Jerusalem as Israel’s undivided capital, saying instead that he would “wait until I meet with Bibi,” kicking the can to a scheduled trip to Israel to meet Prime Minister Benjamin Netaynahu that was to have occurred a few weeks later. For his perceived slight on Jerusalem, Trump received boos from the audience. But Trump never got the opportunity to confer with Netanyahu. Less than a week after the RJC meeting, Trump infamously called for “a total and complete shutdown of Muslims entering the United States until our country’s representatives can figure out what is going on,” according to a campaign press release. Netanyahu swiftly condemned the statement, leaving Trump to awkwardly bow out of the visit. Yet three years later, Trump was struggling to convince Jewish Republicans that he, too, was great for Israel. As the Republican field whittled, and reliable pro-Israel candidates like Rubio and Jeb Bush departed the race, the pro-Israel camp was left with the Evangelically-tinged pro-Israel fervor of Cruz and the hands-off pragmatism of Ohio governor John Kasich, who told Haaretz in April that he would stay out of peace negotiations until the U.S. was invited to participate. The three went head-to-head, along with Hillary Clinton, at the American Israel Public Affairs Committee’s annual policy conference in Washington, D.C. in March to convince Jewish leaders that Israel would be their number one international priority. “We can best advance stability in the [Middle East] by providing Israel our 100 percent support,” Kasich said in his AIPAC speech. Cruz, in his speech, repeated familiar refrains, consistently referring to Israel as “the nation of Israel,” blasting the “moral relativism” of comparing Israel military actions against Palestinian terror attacks, borrowing a favorite Netanyahu phrase that Israel is “using missile defense to protect [its] civilians and [Hamas is] using their civilians to protect their missiles,” and even reviving a 2014 allegation that the FAA’s halting of flights to Tel Aviv during the Gaza war was an Obama power play. Recognizing the significance of the moment and taking a cue from his competitors, Trump showed up uncharacteristically prepared and demonstrated to the Jewish community that he had taken to heart the lessons of the preceding months. 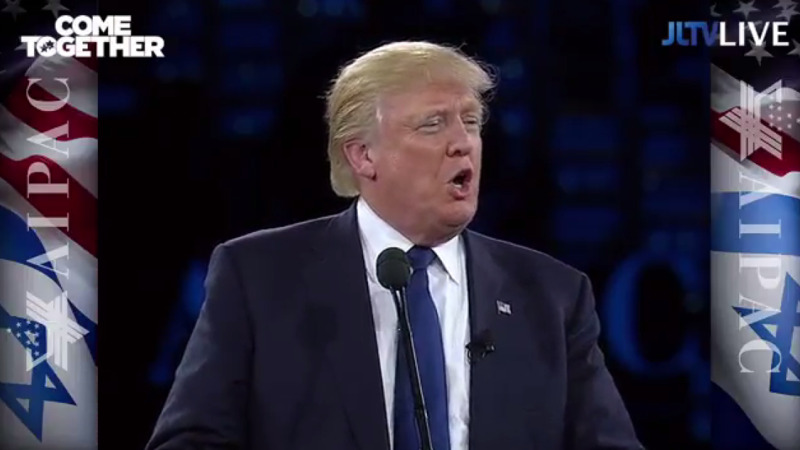 With the help of a prepared speech (written with a healthy dose of input by his son-in-law, the Jewish developer and newspaper owner Jared Kushner, and Ron Dermer, Israel’s ambassador to the U.S.), a pair of teleprompters and talking points pulled from the AIPAC playbook – all a departure from his usual free-verse style – Trump hit a homerun. He also spoke more harshly, albeit confusingly, about the Iran deal than he had previously, promising first to “dismantle the disastrous deal” and then vowing to “enforce it like you’ve never seen a contract enforced before.” He called U.S. President Barack Obama possibly “the worst thing to ever happen to Israel,” and righted his wrong at the RJC meeting a few months earlier: “We will move the American embassy to the eternal capital of the Jewish people, Jerusalem,” he said. The performance was enough to at least temporarily quiet the concerns of the Jewish Republican establishment, though Trump failed to subsequently capture the Jewish vote in the New York primary a few weeks later, even as he won the state overall. And despite his careful concessions to pro-Israel rhetoric at AIPAC, he curiously and perhaps somewhat defiantly hasn’t stopped championing his neutrality when it comes to the Israeli-Palestinian conflict. Though foreign policy does not appear as one of the seven “positions” on Trump’s campaign homepage, he does devote a 50-second video to expressing his support for the Holy Land, one of 20 short videos on his “Issues” page, with a caption that reads “I am very pro Israel [sic]”. Some Jewish Republicans, echoing a general mood of cautious reconciliation in the Republican Party, seem convinced that Trump has learned his lessons on Israel during the primary and are ready to embrace him as the party’s nominee. Others are quietly turning their focus to other political races, turned off by Trump’s offensive statements on Muslims, Mexicans and women, among others. But one person who finally appears ready to welcome Trump into the pro-Israel tent is Adelson, who recently signaled his willingness to financially support the real-estate mogul, billionaire to billionaire. Of all the Israel-related honors that Trump can boast of, this might be the hardest won.